Agreed, 'dissident IRA' would be better. DI overstates how names legitimise or not different politics. While right-wing Labour MPs over here are routinely described as 'moderate' (so that Corbyn and co by association are 'extreme'), disso in NI is usuallly a pretty gentle euphemism for paramilitarism, violence and organised crime. I wouldn't include Eirigi in that. Aye, the change is deliberate. It's a long delayed recognition of reality, although yes, RTE are rude not to reply to your letter. First World problems, eh? Charming. I'll give him (and Cosgrave) some grudging credit for largely preventing the Troubles crossing the border in the 70s. BTW in achieving that their attitude to Northern Unionists (ie, me) was hardly ideal. I'd have been happier if Jack and Liam had been prepared to extradite the gunmen who intimidated much of my family out of their homes. I have many friends from in and around Dungannon and Armagh and they all scarpered South as soon as the degree was acquired from QUB. Every last one of them. But how do you explain that (you know, logic?) to entrenched northern Unionists? Probably more easily than you think. Unionists will readily accept that Northern Nationalists identifying with the South will move there for work etc. Northern Unionists move similarly to other parts of Britain. But all you're saying here Mr Spock, is that people simply by not making the same choices as your mates are illogical, Captain. Indeed. A major reason for NI's economic weakness is that because of the decades of violence only the state was- and to some extent still is- willing to invest economically. However another is that, obviously, it isn't the state in itself. Rather one of many backwaters in a larger state. Do McWilliams and other economists fully take account of this? Because the same might apply in a UI. Perhaps, but we haven't reached that point yet. There's still paramilitarism as covered above, NI manages to be both politically volatile and sterile at the same time. Unionists are accused of a siege mentality, but in large part that's in reaction to Nationalism's foundation myth about an inevitable and eternal united Ireland. You've had independence from Britain for 90 years, but in all that time have done basically nothing to regain the last Green Field. Indeed. The alternatives might have gone worse. The South took decades to become the economically vibrant post-religious utopia that's claimed now. Imagine how much further that might have been delayed in a fractious, intermiittently violent united Ireland? I'm not denying the UDA, UVF etc remain a problem. But there's no need to exaggerate them as a bogeyman. Your current country in expanded form isn't acceptable to any of the main voting blocs in Ireland. Until it starts to become so, planning flags, anthems and local government reforms is the stuff of daydreams. Possibly, but would those issues have been greater than the problems caused by partition? Maybe. Maybe not. Either way that's in the past now, and those problems aren't coming back. Can we get a TL;DR in here? That would be likely to compromise democracy to an undesirable degree. It would also undermine the idea of all Irish people taking responsibility for Irish affairs together, which appeals to me. If everyone on the island was governing themselves in a single unit, rather than being split into two units with one being governed ultimately from Britain, it would enhance both economic efficiency and island-wide democracy. It's a matter of weighing up various factors and working out what balances best. I think independent unity would strike a good balance in weighing up economic, political, social and cultural factors. As you admit yourself, the present set-up peripheralises the north. It's an unimportant backwater in a state of considerable size that cares little for it; its "metropole" is relatively distant. Belfast is a minor city in UK terms, but it's the second city on the island of Ireland. It would take on enhanced importance and possess greater clout in an all-island scenario. Also, border regions like Donegal/Derry or Dundalk/Newry suffered a double peripheralisation effect upon partition whereby commercial centres and their natural hinterlands were separated from one another whilst the respective areas on either side of the border were thereafter governed from remote centralist capitals in Dublin and London (via Belfast). Economic and political unity would (hopefully) reverse the detrimental effects of this completely. You, no doubt, disagree, or might the writings of McWilliams sway you at all, considering you're also a republican (albeit British-identifying)? If your British identity could be reconciled/protected/represented/celebrated as equally Irish in a new united state's institutions and symbols somehow (be that via parity of esteem or new commonly-agree symbols or whatever), could you be won over, you think? I'm not imposing any moral expectation upon you, by the way; just interested in your view as it'd offer a good barometer of moderate/reasonable unionist opinion. 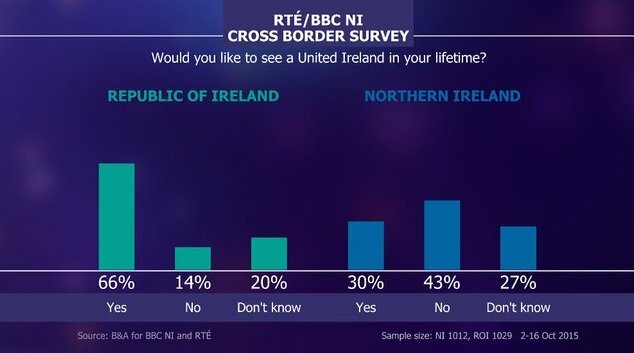 If you recall the 27 per cent (in that recent RTÉ/BBC poll) who "didn't know" whether or not they'd like to see Irish unity in the long-run, they're the ones who'll be convinced by economic arguments. 30 per cent in that poll declared they would like to see unity in the long-run, so another 20.1 per cent would satisfy the criterion laid down in the GFA. If a persuasive economic case for unity can be made, there's no reason why these people can't be convinced. The north has its ultra-conservative "Bible belt" too - in fact, the largest party represents this demographic in rather intransigent fashion - so it's not necessarily as if the south is lacking behind in the socially-progressive stakes. You say this regularly- let's start compromising, basically- and then admit such a suggestion is heretical. This at a time when you can't sell a UI even to NI Nationalists as shown in this month's elections. I do say it regularly and I say it for a nationalist/republican audience. I do acknowledge there is a taboo also, but there's no contradiction in that. I want to break that taboo. The taboo is as much part of the stalemate as unionist ideology. That's why I keep saying it; because it needs to be repeated over and over again to force the discussion until it's no longer a stumbling block on our side (as I perceive it to be anyway). I can only try and effect change on our side; I can't speak for unionists or make moral appeals or demands of them as it's not my business to do that. It's up to us to create the optimal conditions or to do as best as we can on our side and then present our case; if unionists see merit in it, great. If not, then we'll have to try something else. I cover it a bit in some of my writing. However much influence that may have, I dunno, but that's my view and there's no point in keeping quiet about it when I frustratingly encounter what I think are mindsets and approaches counter-productive to realising our ultimate aspiration; unity. To analogise rather simplistically, if someone with whom you've had a falling out holds the key (unionist consent) to a room you want to get into (a united Ireland), you'll have to work with them and win their trust by offering them sincere gestures if they're to hand you that key (their support). Otherwise, you'll never get the key as they'll have no incentive to give it to you considering they simply won't trust you with it. In other words, it's counter-productive for us to expect unionists to make gestures for our benefit; they're happy with the 'status quo' as it is. I don't claim all that should be easy for anyone - it isn't and won't be considering the level of disrespect and contempt political unionism so frequently demonstrates for nationalism - but I'm simply outlining what I see to be practical reality. That's how bargaining/negotiation works. We can't have our cake and eat it. Of course, we can just wait for a growing nationalist population and magically hope for 50.1% some day, but it's not all that inspiring and I do think a new arrangement will have to consider the interests and fears of unionists regardless if it's to be stable and properly representative of all citizens. I want a proper pluralist and secular republic; not a triumphalist, vindictive and exclusively hibernianist one. Last edited by DannyInvincible; 24/05/2016 at 4:59 PM. The long term impact of this has been a disengagement by nationalists/republicans from electoral processes. If you consider that there has been a recent campaign to convince everyone that even a Catholic majority will not see a vote in favour of a United Ireland. Whether we like it or not, effectively politics comes down a sectarian headcount of sorts as the rise in votes for SF and SDLP has mirrored a rise in the percentage of the population who are recorded as Catholic in the various censuses. Recently there has been a spate of organisations presenting polls and surveys that are claimed as evidence that “Catholics” don’t want a United Ireland. These include the Life and Times Survey, which is compromised by its own data on party support which is nowhere near the level consistently returned at recent elections (if it can’t replicate that, then what value the responses to its other queries). Or the likes of the LucidTalk poll that asked an indirect question about a United Ireland and offered to ‘yes’ answers and one ‘no’ (to show how weighted the question was, it’s others had significantly more detailed questions and nuanced answers balanced equally between yes/no type options). Some polls (BBC or Belfast Telegraph, I think) even claim to show, via a badly written question, that large numbers of SF voters, I think it was given as 17%, don’t want an united Ireland (which seems completely counter-intuitive). What the last poll did seem to hint at, though, is how far some people when tolerate a status quo for the sake of good relations, even if it is not what they actually want. If that poll is correct that 17% group might represent the pragmatic soft core voters of any particular proposition (I realise, I’ve just culled a largely meaningless statistic out of this, but it’s just to illustrate a point later). So, in the absence of gerrymandering, the current project seems to be to continue to disengage people and deter them from voting when given the opportunity. At the same time, SF and SDLP have both been captured by a reluctance to be seen to not work the six county institutions to avoid being criticised by unionists (who paradoxically and shamelessly do their best to render the institutions not fit for purpose). Having been hemmed in by the logic of demonstrating an ability to offer leadership that is not as asymmetrical as that offered by unionism, there has been an absence of energy in pursuing active policies that might create the circumstances in which a united Ireland might be achieved. SF have pushed some projects recently, but ultimately, the current policy is largely to grind out a Catholic majority and wait for demographics to deliver. There needs to be a reality check for those who advocate a united Ireland and a proper assessment of support for it. One approach would be to ask individual councils to bring forward and vote on a proposition modelled on the lines used by Fermanagh and Tyrone in 1921 (oddly, Churchill’s dreary steeples reference was to the fact that unionists claimed the right to secede and denied Fermanagh and Tyrone the exact same right). This would, in effect, require SF and SDLP to articulate their position here, not probably a problem for SF, but maybe shaky for the SDLP. If councils undertook this vote before the next local elections, it would at least afford voters an opportunity to either endorse or reject the proposal (in their attitude to the parties involved). While one possible outcome is a debate about re-partition – I don’t believe that London would have any interest in this. Part of the attraction of any united Ireland project to London is getting its expensively maintained Irish real estate of its exchequer books. It isn’t an accident that, with the economic and social fragmentation created by the border, both north and south has suffered as viable economic entities (the north has never been viable, the south only very sporadically). London pays a hefty, non-returnable subsidy of £8bn-£9bn annually to maintain unionism’s vanity project. I believe a realistic prospect of a majority of voters supporting SF and SDLP would be sufficient or London to position an exit strategy, which would include influencing the news agenda and environment in a way that would hasten a favourable outcome. London no longer has a strategic interest in the north, it is simply stuck with the bills. London is where the real paradigm shift will take place. From a mapping point of view, the number of nationalist majority councils (presuming they all pass a resolution) would demonstrate the extent of support for a united Ireland. In some ways, this would be an democratic outworking of Michael Collins post-partition strategy which was to see nationalist areas remain ungovernable from Belfast and making partition pointless (in the hope that the Boundary Commission would scrap it). Impetus for a united Ireland project would then bring that 17% pragmatic issue into play. If it becomes more visible that we are entering a transitional phase, those pragmatists close to the middle on the unionists will, at some point, become soft nationalist voters in accepting a new status quo (if they see it as either emerging or imminent). That will be dismissed as idealistic, but it will be dismissed by the same people who are insistent that we accept polls/surveys that claim to show that nationalists behave in that way. And as to the most obvious point about it being a divisive strategy? The whole ‘Northern Ireland’ project is divisive. Even in its most watered-down forms, it requires an artificial and synthetic identity to sustain it. Its kindest, non-partisan face is simply an exhortation to accept the artificial identity and use that as a mechanism to retain the border and the social and economic dislocation that goes with it. Unionism continually and ever more shrilly insists on the primacy of its values and ideology to underscore that dislocation, to a point that has now clearly alienated many of those from backgrounds that traditionally voted for them. In many ways, And I suspect that the Agreements (from Good Friday to St Andrews) are in danger of becoming the new Boundary Commission, in the sense that working (and being seen to be good citizens in working) the Agreement institutions is distracting from the strategic goals that nationalism and republicanism espouse. I think it is a message London will want to hear. On the recent northern election, it wasn't a border poll, nor should the results be indicative of opinion on the constitutional question. Many nationalists didn't vote and many others voted People Before Profit (PBP). I'd actually have voted Eamonn McCann/PBP myself had I been still in Derry as I've long been an admirer of his and like his progressive policies/ideas. I still support Irish unity as well, so don't necessarily mistake the big PBP vote in nationalist areas for indifference on the question of unity. (Although, it should also be said that PBP are a 32-county party in the tradition of James Connolly anyway, despite them designating as "Other" in the assembly.) I know some people/acquaintances involved in PBP and they'd be very clear as to their national identity and position on the unity question. They identify as 32-county Irish and don't support the 'status quo'. Indeed, two of them go by Gaelic versions of their names. Much of the political terrain you operate in now is determined by the Good Friday Agreement and peace process in Northern Ireland. Can you describe your criticisms of the situation in the Six Counties? In my view, the fundamental narrative of the peace process is false. You can make criticisms of that without wanting a return to violence. The end of the war has opened up opportunities that did not exist previously — people can discuss politics in a way they weren’t able to before. But that was not possible in the decade following the peace process. Particularly for the new generation the starting point is different. And we should say, too, that Sinn Féin is more progressive than the political forces which went before them in government in Northern Ireland. That is a step forward. But the peace process was built on allowing each faction to interpret ambiguities as they wanted. Maybe they thought this was a good thing in the short term, to end the war, but each side has clashing interpretations of the agreement and that will have to be reckoned with at some point in the future. When it is reckoned with, today’s narrative will carry with it a lot of problems. For instance, take the idea that the Irish Republican Army bombed its way to the table. This myth was tolerated by the state for a number of years and fueled by them in their “flattery” about how sophisticated the IRA had been and so on. It gave a credence to the republican position that what little was won was won militarily. Those in the dissident camp then can believe and say “we didn’t get much, Sinn Féin let us down, but if we had fought on militarily we could have achieved more.” In reality, this is not the case. But it leads apolitical people who have gained nothing from the struggle into a logical conclusion — not because they are stupid, but because of the logic underpinning the process — that there is some value in continuing some aspect of the armed insurrection. To understand the peace process you have to see that the people who have gained the most from it are the educated professional classes, and their children, on both sides of the sectarian divide. There is now a shared interest among the middle classes in defending what they have gained — on the back of struggle by others. How much of a role do you think this middle-class consensus plays in propping up the peace process? Does the imposition of austerity on working-class communities have a potential to undermine it? We now have two parties in government who are representing the middle classes and who benefit from the status quo, Sinn Féin and the Democratic Unionist Party. They are kept apart by the sectarian nature of the peace process and its institutions, which divides things between two communities. Then we have a layer of people below who have been left out completely and are becoming disillusioned. But, because of the underlying sectarian logic, not just of the institutions but of the story told to put this all together, this feeling is pushing the Catholic and Protestant working class further apart, not closer. At the same time, the two parties in government tell their constituencies “we’ve won” while they cut corporate tax rate and introduce austerity measures. Sinn Féin have moved further and further to accommodate this new reality and, in doing so, created a dynamic they largely don’t see. They are losing the trust and the support of the people who once voted for them, the Catholic working class. Those people have been replaced by the Catholic middle class which most benefited from the peace process. These are former Social Democratic and Labour Party (SDLP) voters. They have a vested interest in stability and participation in the state, so they now support Sinn Féin. But many who fought in the democratic and the armed struggle perceive themselves to be no better off. The economic and social system we have has consigned them to is continued welfare, poor education, and now austerity. Yet their opposition to this is described as “dissidence” and dismissed. Meanwhile, I am seeing things come full circle. I have lived to see food banks in Dungannon, where I work. When we were young and angry enough to be marching here against poverty in the 1960s, there was nobody living on food banks. The social housing waiting list in this town is now greater than it was when the Dungannon Housing Action movement started. And yet, at exactly the same time, the Catholic middle class has never been better off. They were brought in from the cold in the first years of the peace process when there was the security of state jobs. There weren’t jobs for the working class, in many cases, but there was welfare. The situation has reached such a stage now, though, that even that is under attack. The Tories don’t feel that they need it. Why would they? People want peace and are willing to comply. The flip side of this is that for many people poverty will be written in as a condition of the peace. The politicians have organized this year so that we will have our election first and the welfare reforms planned under the Tory Fresh Start agreement second. This is because everyone knows the depth of these reforms. We in the North are headed for a period of poverty that will scare people. I see it because of where I’m working. Sinn Féin will be unable to mitigate against that when it hits the ground. They will be able to say the British government cheated us, but that won’t be enough. What do you think led Sinn Féin to that point? Is there any chance they could take a leftward turn, bringing their Northern politics closer to the ones they espouse in the South? I remember my last serious conversation with Gerry Adams on the peace process in the 1990s. I asked him then, “What is your Plan B if this doesn’t work?” He didn’t have one. It was clear that this was the only game in town. We are seeing the effects of that now because even if they wanted to stand up to austerity they couldn’t do it. I missed a key point in that conversation. At the time, I thought, “This is a high-risk, short-term strategy.” In fact, it wasn’t that. It was a low-risk, long-term strategy. The two sides had fought to an impasse and that impasse was being set up as the new normal. The British policy was to demilitarize but also to demobilize and demoralize the resistance to its government. Sinn Féin became the mechanism by which that could be done. The peace process, which was supposed to last four or five years, is now almost twenty years old and is not finished yet. For Sinn Féin the problem is one faced by a lot of electoral parties. You organize a mass movement and you oppose the political system, but to create a space to advance the struggle at a certain point you go into elections. If you win, you become part of that political system and that imposes its own logic. In order to advance the struggle you have to defend your position, but to defend this position you think you have to make sure a majority votes for you. The end result is that while you got into elections to say what needed to be said, you ended up saying what needed to be said to keep your elected position. Today, many in Sinn Féin believe that if Martin McGuinness was first minister up here and Gerry Adams was part of a government in Dublin then they would be nine-tenths of the way to their goal. This way of thinking is focused on institutions. It is first and foremost nationalist, with republicanism and democracy far behind. It will be difficult for Sinn Féin to continue to manage this contradiction in their party. At the same time that they are losing people in the North, workers in the South are turning to them. But Ireland is too small in the long term for one party to be able to be a middle-class party of respectable politics in the North and a working-class party of resistance in the South. There will come a time when that isn’t possible, and I don’t think it is far away. The task of socialists is not to hammer Sinn Féin because of their positions in the North or to exclude them from progressive movements because their “hands aren’t clean” in the North. Instead we should try to hold them to the progressive positions they adopt against austerity and push that side of the contradiction. How should we understand “loyalism”? What are its characteristics? What is it out to achieve in the twenty-first century? Loyalism is clearly differentiated in the North from Unionism. Unionists are middle class; they believe that their interests are best served by maintaining the current situation, British control of this part of the island. They’re like Falkland Islanders, in that sense. Loyalism’s hallmark is that it represents the poor. Loyalists are working class or unemployed. As the American system disgracefully refers to some of its poorest people as “white trash,” loyalists are perceived within British nationalism as an underclass. I don’t understand any human being starting a conversation saying that they are not human. I ask them why they start that way. There is a clear lack of self-esteem and also a loss of confidence. If you think about the “dissidence” in poor nationalist communities among people who gained nothing from the struggle despite giving so much, the sense in the loyalist community is that they actually lost. They lost to everybody despite unwavering loyalty to the regime, even to those who challenged it by force. The anger in loyalist communities is fueled by them still not having the price of a loaf and seeing Martin McGuinness up running the country. This is why I have always believed that this whole process is further sectarianizing the North. The infrastructure of the peace was sectarian itself and continues to reproduce the problem. The result of that is that, while there is some competition between Bernie Sanders and Donald Trump in the United States for poor whites, or between Jeremy Corbyn and the UK Independence Party in Britain, the loyalist community is stuck without such an avenue. Loyalist politics is based on British nationalism and, for the same reason that Irish nationalism has aligned itself with progressive struggles, British nationalism is compelled to be reactionary. But that is only part of the history of Ulster Protestants. They have been denied other parts of their history, such as the radical struggles of the Presbyterians or the labor movement. Regaining that won’t happen in history class. It will only happen by fighting in your corner and discovering that someone else was here before you. I'm well aware, which is why I emphasise the importance of the cultural/national/political side of things too. BttW makes a fair point. NI politicians can't use current or notional future paramilitarism as an excuse for economic woes.They can though point out the effects (as I did above) of 30 years of deliberate economic warfare. It's no exaggeration to call it that. DI and others have referred David McWilliams in detail above. But this discussion isn't really about economics. Rather it's counter-factual history used to justify a political position. With some exaggeration: we can never know how richer or more peaceful (if at all) NI would have become without partition. But we do know that for all its economic weakness it hasn't been depopulated like say rural East Germany, or Russia's rust belt after the end of Soviet Communism. I've regularly admitted here that NI could become unsustainable at some future point; such a depopulation would be one form of evidence of that. In such circumstances the Unionist rump would still have choices: including return to the other island, or make the best of things as an earlier generation did in the 1920s and after. The EoS argument only goes as far as the point where it starts to contradict the more sentimental case for Irish Unity (the 'Foundation Myth'). DI admits this above. NI is disadvantaged partly as the most remote, smallest and arguably poorest region of a centralised country, and partly as a volatile border area. If that border was pushed into the sea, the volatility and thus threat of renewed violence would almost certainly remain. So might the temptation for a Dublin administration to keep it and the violence at arm's length. NI would be effectively just as peripheral as before, with potentially a larger disaffected minority than it has now. 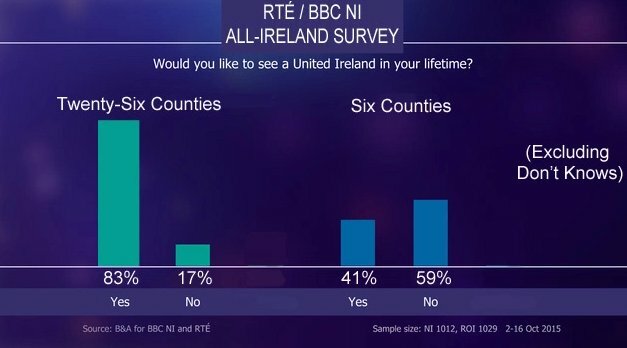 I think one of the most interesting results of the October 2015 RTE/ BBC survey was that aspirations for Irish Unity were kicked as far into the future long grass as possible. In part that reflects framing the question as 'would you prefer it in the mid-term or lifetime? ', but it's also the (deathbed) sentimentality I mentioned above. The most likely future behavior of non-voters in any given general election is that they won't vote in them either. Encouraging an increased turnout seems as difficult in NI as elsewhere. Of course I realise PBP's voters in Belfast or Derry are unlikely to support Linfield FC or Drumahoe Presbyterian. But the party isn't just a new Nationalist mirror image to Jim Allister's radical Unionists. They didn't have to designate as 'Other', but they did. The majority of the country including a significant amount of Catholics would prefer Northern Ireland to remain part of Great Britain. Historically, Northern Ireland has benefited economically from being part of Great Britain. It's naive to expect Northern Irish unionists to want a United Ireland when their own economic self-interests wouldn't be served, when "people" like Gerry Adams and Martin McGuinness have mainstream political roles in Irish society, and when bombings of English cities are still relatively fresh in the memory. The economists quoted above claim that Unionists' economic interests would be served by UI now, even if they weren't in the past. It's possible to see a case of that but still to think unity unlikely in the foreseeable future. There's a lot in this. SF have form for losing goodwill by not adapting to changing circumstances. In the early 70s, they and others forced the closure of Stormont, OMOV, housing reform and more. Then carried on a shooting war for 25 years that achieved little more. Fast forward to 1998, and there was much sense in involving ex-prisoners in senior political roles, to show that all those years doing sociology degrees in Long Kesh and Armagh weren't wasted. But that didn't mean the retired gunpeople had to stay in charge until today, basically. On which: the new 10-member NI politburo includes four Nationalists, four women (including one not yet 30), and only one flat-Earther who thinks the Planet Gaylord orbits in some distant galaxy. (Chris) Huzzah! Abortion law in the north is nearly as restrictive, although, if I understand correctly, exception can be made if there is a significant health-risk rather than a significant life-risk to the pregnant woman. The "Other" designation has always been PBP's policy. They're 32-county Connollyite, but they're not a nationalist party (in the sense that they view this as a cultural designation as much as a declaration of a position on the constitutional question). Even though their broad support-base comes from mainly the nationalist community, they try to transcend national identity differences. I certainly didn't mean to imply they were a mirror image of TUV! Far from it. TUV are anti-radical and steeped in (British) nationalism; it's integral to their identity. The programme of People Before Profit tries to represent the interests of people in the bottom half of society, irrespective of the community they come from. We will fight all the way for everybody who is being left behind in this society. We would register at Stormont not as Unionist or Nationalist but as “Other”. Nobody in Northern Ireland can be denied their sense of identity or loyalty to their community. But this doesn’t have to be the only aspect of life dictating our politics. The actual conditions we live in and what is proposed to improve them should be the decisive factor. The “Vote Catholic” leaflets make a mockery of Sinn Féin claims to have risen above the hibernianism of Wee Joe Devlin to connect with the noble tradition of the founders of Irish republicanism. On March 1st 1798, Wolfe Tone observed of the Treaty of Tolentino, under which a humiliated Pius VI surrendered the Papal States to Napoleon: “The circumstances relating to this great event are such as to satisfy my mind that there is a special Providence guiding the affairs of Europe . . . turning everything to the great end of the emancipation of mankind from the yoke of religion . . . Many people thought, and I was one of their number, that it was unwise to let slip so favourable an opportunity to destroy forever the papal tyranny. . .” And screeds more along such sensible lines. 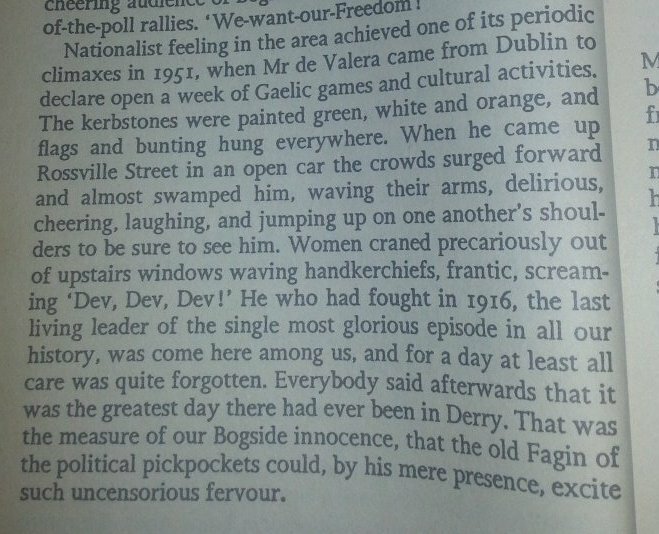 Surely this passage should be read out every year at Bodenstown? Or at the top of the New Lodge Road. He clearly saw the people as being blinded by patriotism. Asked about the left wing challenge to Sinn Féin in the coming Northern elections, Gerry Adams defended himself with a blatant lie. People Before Profit were, he said, a ‘two nations’ party. The ‘two nations’ approach was used by the late Conor Cruise O’Brien to defend partition by suggesting Ireland was one island but had two distinct, Catholic and Protestant nations in it, incapable of uniting. This has never been the position of People Before Profit and Gerry Adams was trying to deflect from the real issue. In the North, his party has joined with the DUP in imposing neoliberal policies on working people. Under the latest ‘Fresh Start’ agreement, Sinn Féin is supporting the removal of 20,000 jobs in the public sector and has opened the door to a widespread sell-off of public assets. By contrast, it is planning to cut corporation tax on big business. West Belfast, where PBP is mounting its strongest challenge, is a constituency that is highly dependent on public services. So Sinn Féin’s pro-austerity policies will hit working people in this area hardest. Gerry Adams only defence strategy is to play the nationalist card. But it will not work. People Before Profit is a 32 county party that stand in the tradition of James Connolly who predicted that partition would produce a carnival of reaction. We believe that the only way to bring people together across this island is by building a grassroots movement from below, based on people power and socialist politics, not one that is based on locking in the two existing Irish states. We want working class unity to develop from a 32 county anti-austerity movement that challenges both Irish states. The Sinn Féin leaders take a different approach. Today, they think that by working through cross border institutions, they can move towards a united Ireland. But these institutions are fundamentally conservative and designed to impose neoliberal policies on the whole of Ireland. So enthusiastic are the Sinn Fein leadership about this approach that they brought the British Ambassador to their Ard Fheis to show their commitment to working inside the political establishment. There would be no room for the British, or the US or German, Ambassador at a People Before Profit Conference. Last edited by DannyInvincible; 25/05/2016 at 3:13 PM. That's not true. There is majority sentiment for unity on the island. If the island was the unit of democratic authority, I wouldn't have any concern about the unity vote winning comfortably with some adequate debate and preparation in advance. Are you disputing Adams and McGuinness' status as actual people? Many unionists do seem to view Sinn Féin as toxic, mind, and would most certainly see the party as a major stumbling-block, so it may require a new nationalist or republican party (with no militant past) to try and fully bridge the trust-gap if it's something Sinn Féin aren't up to. Last edited by DannyInvincible; 25/05/2016 at 3:15 PM. By the way, GR, did you see McCann's electoral victory speech? Or song, even. He sang 'The Internationale', ha. Indeed- or put another way, they're broadly as bad as each other. The politics arguing against a UI are so entrenched that the Southern 'offer' on economics, social policy etc. has to be a lot better to have a chance of success. The simple reality is that PBP'S success in Belfast and Derry has weakened SF and thus Nationalism in NI. On TUV, I meant (but explained badly) that Allister personally was quite effective in the last Assembly arguing procedural issues. Other than Agnew there wasn't anyone else in the real Opposition . Not that JA is in any way progressive on more substantial issues. I think TOWK's reference to "the Country" above means just NI, not all Ireland. Last edited by Gather round; 25/05/2016 at 3:59 PM. Except PBP are Nats in all but name. As DI points out above. They were/are rightly making a point about SF. Isn't People Before Profit another guise for the Communist Party with just a more Touchy Feely name? What's with the SDLP and the Unionist Party now going in to opposition? A vote winning tactic or the long spoon isn't long enough anymore to sup with the respective devils. I don't believe that this is a religious issue. A lot of people with no religious leanings whatsoever would not be in favour of abortion. Moral issues don't have to be religious issues. McCann's a Trotskyite and a member of the Socialist Workers Party but PBP is a leftist alliance and not exclusively SWP. The fact PBP is an all-Ireland party should be proof enough it's a nationalist organisation.